Getty ImagesFacebook founder and CEO Mark Zuckerberg. A Facebook user was startled to find that the social network had been keeping records of his phone calls and texts. A report from Ars Technica corroborated his findings. 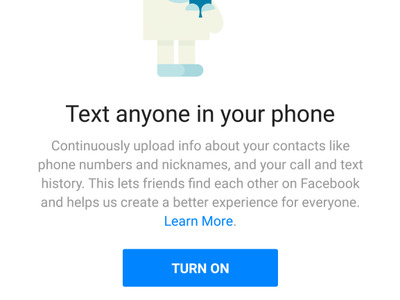 In response, Facebook says that it’s an opt-in feature on Messenger for Android, as well as the low-data Facebook Lite – and that it’s about making the social network better. However, there’s reason to believe that the main Facebook app could have been quietly collecting this data too, until Google made some changes to Android in October 2017. Over the weekend, one Dylan McKay downloaded the archive of all his Facebook data – and found that the social network had been keeping extensive records of the calls and texts he had made from his Android phone. A report from Ars Technica corroborated McKay’s findings not long after: under certain circumstances, Facebook’s Android apps will keep logs showing the names of the people you called and texted, how long the conversation lasted, and the other party’s phone number. McKay’s original Twitter post has almost 40,000 retweets at the time of writing. Privacy fears around Facebook are at an all-time high following the Cambridge Analytica scandal, where 50 million users had their data used improperly by a political research firm. In response to reports over the weekend, Facebook published a blog entry giving its side of the story. First, Facebook says, it didn’t do anything without permission. It says that keeping logs of call and text data is an opt-in feature on two of its Android apps: You get prompted to share that data upon installing Facebook Messenger, and the low-data Facebook Lite. Keeping those records “helps you find and stay connected with the people you care about, and provide you with a better experience across Facebook,” says the blog. FacebookThe screen on Facebook Messenger for Android that prompts you to upload your call history. However, the Ars Technica report gives a little more reason for Android users to worry. Until Google instituted some changes in October 2017, allowing an app to access your contacts could also give it access to the kinds of call and text records in question in this matter. According to the report, all of the call and text records end in October 2017 – which suggests, but does not prove, that the main Facebook app for Android was taking advantage of that method to get the data. Still, Facebook maintains that this has always been an opt-in feature, and that users would have been prompted. Also of note is that Apple’s iOS, the operating system on the iPhone and iPad, doesn’t allow that kind of access to call and text data at all without very specific permission. That means Apple fans don’t have to worry as much about Facebook having call or text records. Facebook provides a tool to see which contacts have been uploaded to Messenger, which you can get to here. But it’s a good reminder – if you’re really concerned about online privacy, think twice about uploading your address book. Read the full Ars Technica report here.